I'm sitting in the shop, staring out at the snow, glad that I can be snuggled up in and armchair with some super warm chunky wool on the needles. I finished my cabled v-neck tank a couple of weeks ago but it is nowhere near warm enough to be going without sleeves so I cast on this chunky cardie from Hayfield. 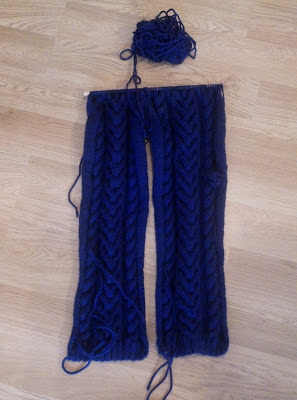 I'm using the King Cole Merino Blend Chunky in French Navy and I honestly can not wait for it to be finished. Not because I'm not enjoying it - it's fab to knit with - it's just so bleeding cold up here that I want to be wearing it! The fronts and back knitted up in no time at all. I made a few boo boos in the cable pattern on the back but I'm going to leave them in - a) because, as mentioned above, I'm desperate for a warm cardigan and b) because I'm feeling a little lazy! Can you spot the not-so-deliberate mistakes? 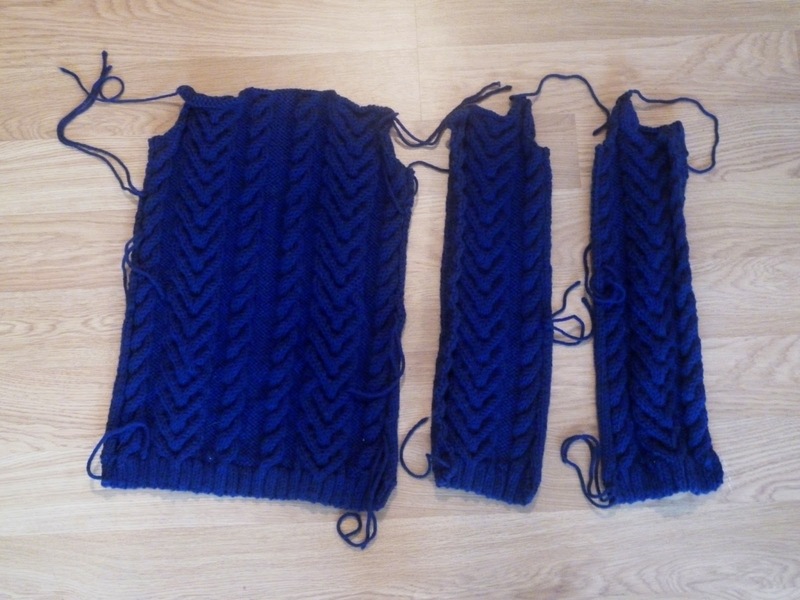 I decided to do both sleeves at once and they now seem to be taking forever! I'm almost done shaping the raglan so, hopefully, I will be able to get onto that giant yoke this afternoon. 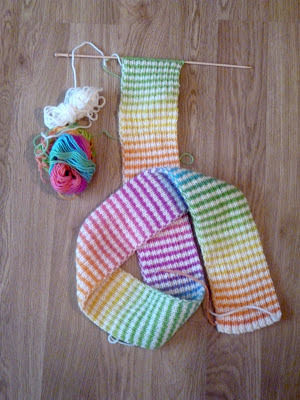 Also on the needles is the never ending rainbow scarf of doom. I had a ball of Knit Picks Chroma in Lollipop for over a year and I started many things and frogged them because it was just too sugary sweet on its own. I decided on 2 row stripes, alternating with a natural coloured aran weight yarn and I just love it. I thought I would just knit the whole ball of chroma but it was 100g to start with, I'm just about to start on the 3rd 50g ball of natural yarn and I've just weighed what I have left and there's still 30g to go! It's definitely going to be a warm scarf, I may have to wrap it 5 times to keep it from trailing on the ground. I'm linking in with WIP Wednesday. Take a look what everyone else is up to. I'm willing to bet most people won't notice the mistake. As Kaffe Fassett would say, "It's a unique design element". Your rainbow scarf is very pretty and I bet you are going to enjoy wearing it. Thanks for stopping by and posting on my blog today. I do love that scarf, the white with that variegated is so nice together.